Helping to ensure that agriculture remains one of Pennsylvania’s top industries and continues to help feed the world, the 2018-19 state budget made several critical investments to address the industry’s most pressing challenges. To assist dairy farmers who are battling a changing market, $5 million will help with research and development programs, along with grants for sustaining the viability of their operations. Pennsylvania dairy farming supports 52,000 jobs and contributes $14.7 billion to the state’s economy. To find out if the dairy products you purchase are made in Pennsylvania, click here. Another $3 million will be directed to help combat the spotted lanternfly, an inch-long black, red and white spotted insect native to Southeast Asia that threatens to destroy $18 billion worth of agricultural commodities, mainly apples, grapes and hardwoods. This funding will help increase detection and control efforts, and coordinate multi-agency response, outreach and training. Several ag line items were also restored or increased in this year’s budget, including agricultural excellence; agricultural research; agricultural promotion, education and exports; hardwoods research and promotion; Livestock and Open Dairy shows; state food purchase; and food marketing and research. Fair season has started! If you’re looking to visit one of the state’s many fairs and festivals this summer, the 2018 Pennsylvania Fair Guide is now available online here. Union County West End Fair, Aug. 5-11. McClure Bean Soup Festival and Fair, Sept. 10-15. What’s the Latest on REAL ID? The Pennsylvania Department of Transportation is continuing its work to comply with the federal REAL ID Act by offering state drivers and identification card holders the option to purchase a REAL ID-compliant license or ID card. Beginning Oct. 1, 2020, a REAL ID-compliant license, identification card or other form of federally acceptable identification (such as a valid passport or military ID) will be required to board domestic commercial flights, enter a military base or enter certain federal facilities that require ID at the door. 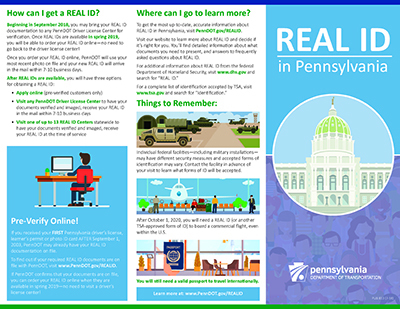 For everything you need to know about how to obtain a REAL ID, check out this informative brochure available from PennDOT. Click here to view REALID brochure. With Pennsylvania consistently recording among the highest rates of new Lyme disease cases each year, the General Assembly directed $2.5 million in state funding in this year’s budget to help combat the spread of the disease and treat those affected by it. Efforts will include building a more robust Lyme disease prevention and education program, conducting more well-rounded surveillance through activities like a statewide environmental survey, and improving participation in tick-borne disease surveillance with providers and local health departments. The funding specifically addresses many of the recommendations outlined by the Lyme Disease Task Force, which was created by Act 83 of 2014. There are important steps you can take to protect yourself and your family from ticks carrying Lyme disease. Before heading outdoors, it is important to cover exposed skin, wear lightweight and light-colored clothing (to aid in insect detection) and use an insect repellent containing 20 percent or more DEET. Once returning home, immediately check yourself, children and pets for ticks.Take a shower to remove any ticks that may be attached to your skin. Carefully check your clothing and gear and put them in the dryer on high to kill any ticks. For more information on ticks and tickborne diseases, visit the Centers for Disease Control and Prevention’s website. Events in July at the Lewisburg Children’s Museum: Saturdays from July 7-28; each session starts at noon. Workshops include designing your own paper rockets, learning hands-only CPR, reading a story about sandcastles and designing your own, and building a garden terrarium. Click here for additional information. Richfield Dutch Days: July 17-21. Ride wristbands available nightly. Chinese Auction with nightly drawings. Music by area churches and nightly entertainment. Many options for food, including nightly meals served at 4:30 p.m. The Bicentennial/Dutch Days 50th year parade will be held Saturday, July 21, at 4 p.m. Click here for additional information. McClure Pot Pie Festival: July 18-21, 4-8:30 p.m. at Cold Springs Grove, Ohio Street, in McClure. Chicken pot pie will be served daily at 4 p.m. and nightly entertainment is planned. Click here for additional information. Blueberries and Bluegrass: July 20, 6-9 p.m., at Mifflinburg Community Park. Come enjoy everything BLUE at Mifflinburg’s Community Park. Featured are blueberry pie by the slice or whole pies, blueberry ice cream, blueberry topping and the famous blueberry Whoopie pies. Food vendors and live bluegrass music. Free admission. Bring your own lawn chairs! Click here for additional information. Hops, Vines and Wines: Saturday, July 21, from 2-6 p.m. on University Avenue between Broad and West Pine streets. Over 40 breweries, wineries and distilleries will be present at this year’s festival. Click here for additional information. Middleburg Community Pool Splash Hop hosted by Paxtonville United Methodist Church: July 21, 6-9 p.m., at Middleburg Community Swimming Pool, 72 Golf Course Road, Middleburg. Activities will be available for the kids, volleyball, live music and more! Free hot dogs and soda will be provided to everybody who walks through the gate (until supply runs out). Click here for additional information. Mifflinburg Hose Company Carnival: July 23-28 at Mifflinburg Hose Company, 325 Chestnut St., Mifflinburg. Thrill rides, games, great food and fun! Parade will be held on Saturday at 4 p.m. Click here for additional information. West Beaver Memorial Pool and ABATE Motorcycle Ride/Chicken BBQ: Saturday, July 28, at 11 a.m. Benefits the West Beaver Veterans’ Memorial Pool and A.B.A.T.E. Serving chicken halves and platters. Kreamer Fire Department BBQ Chicken Sale: July 28 at 11 a.m. at Kreamer Fire Department Station 120, 37 Manor Drive, Middleburg. Platters include homemade baked beans, macaroni salad and chicken are available for $8. Chicken halves are also available for $4.50 each. Contact 570-837-1707 to call in your orders on Saturday. Click here for additional information. Community Pig Roast hosted by COOL Ministry: Aug. 4, 11 a.m. to 7 p.m. at East Snyder Park, Selinsgrove. Free pig roast. Pork sandwiches, hot dogs, coleslaw, macaroni salad, baked beans and desserts being served at noon. Inflatable slide, bouncy house and obstacle course, story time, and arts and crafts available for the kids. Click here for additional information. Union County West End Fair: Aug. 5-11, at the fairgrounds in Laurelton. Experience the past as you enjoy the excitement of a traditional old country fair. This year’s theme is farms, families, fairs, fun. Click here for additional information. Middleburg Reliance Hose Company #1 Fireman’s Carnival: Aug. 7-11. Rides, games, great food, and fun! Lunch served daily and nightly entertainment. Parade will be held on Thursday at 6:30 p.m. Click here for additional information. Lewisburg Youth and Adult Sprint Triathalon: Aug. 10 at 6 p.m. for kids and Aug. 11 at 8 a.m. for adults, both at Lewsiburg Area Recreation Park on St. Mary Street, Lewsiburg. The kids event is open to children ages 7-14. Click here for additional information. New Berlin Legion Helping Hands Benefit Ride: Aug. 11 at 10 a.m. at American Legion Riders Post 957, 640 Water St., New Berlin. Registration with ride beginning at noon. All proceeds to be divided among several organizations that directly support/help veterans. Cost is $15 per rider and $5 per passenger. A meal will be provided following the ride for all participants. Click here for additional information. 6th Annual Snyder County Night Out: Aug. 21, 4-7 p.m. at East Snyder Park. Sponsored by the Snyder County Coalition 4 Kids, the event offers kid-friendly activities focused on safety and wellness, and also helps the community connect with law enforcement officers and first responders. Click here for additional information. In appreciation for their service, both the state and federal governments offer a number of benefits and services to our veterans and their family members. If you have questions about or need assistance with obtaining these benefits, several options are available to help you. Dan Falls, a veterans field service officer with the American Legion, is available at the Mifflinburg office on Wednesday, July 25, from 10 a.m. to 3 p.m. and on the fourth Wednesday of each subsequent month. You need not be a member of the American Legion to obtain this assistance with issues such as compensation, education, pension, health care and death benefits. Appointments are required and may be made by calling the office at 570-966-0052 or 570-837-0052.